Find out all you need to know need to know about the best and most rare vintage guitars from the Sixties! 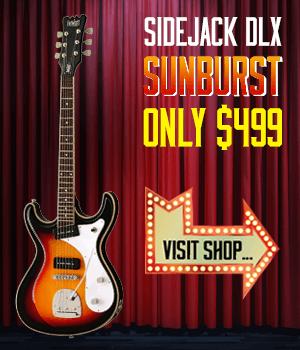 Besides bigger brands such as Fender and Gibson, several smaller brands flourished in this decade, and names such as Airline, Supro, Teisco and Hagstrom are today very desirable. It is hard to imagine today, but in the early 1960’s having an electric guitar in your home was rare. In fact, it was likely that your parents were steering you in the direction of accordion lessons. Yikes! 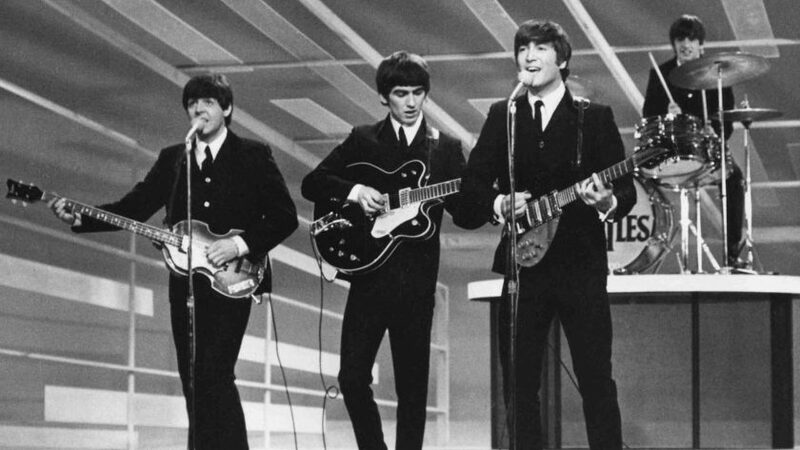 The Beatles – and of course others – stopped all that. Suddenly, electric guitars were #1 on every kids Christmas list. Companies that had been manufacturing Accordions for 20 years, retooled for electric guitars. EKO was at the forefront, and within 2 years they were shipping over 10,000 electric guitars to USA per year. For most North American kids, including myself, their first guitar was an EKO or some Japanese import. 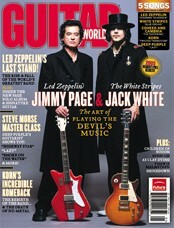 Fender, Gibson, Gretsch, Rickenbacker… these were all too expensive for our parents to buy for us. Hence, the foreign guitar manufacturers gave us what we wanted. Tip of the iceberg! Here I’ve highlights a few of my 60’s guitars, but it only scratches the surface. You’ll see the inspiration for launching Eastwood Guitars in these images below. Below: A nifty 1959 Fender Musicmaker. I took it to the local luthier and asked him to refinish it, to remove the awful sticker. He said, “What?! That’s a Vintage Sticker!” It took me a while, but now I see his point of view. 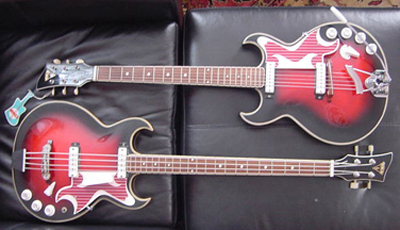 A couple of Fender Duo-Sonics, which were the inspiration for the Warren Ellis Tenor Series. The Airline Guitars were sold through Montgomery Ward. 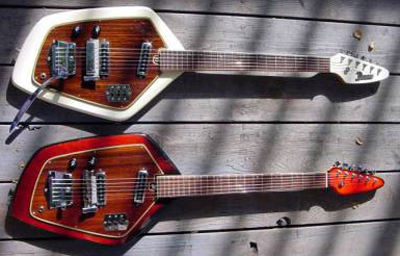 Below: Perhaps my favorite 1960’s guitars, the Domino’s. I have owned many Domino Californian’s over the years (the VOX Phantom copy). They are fun to fix up and fun to play. Domino made one of the better quality reproduction guitars in the late sixties. The Spartan pickguard was autographed by Edwyn Collins. Below: If your first electric guitar was in the 1960’s, there is a good chance it was a Teisco. Here are a few from the mid-sixties. 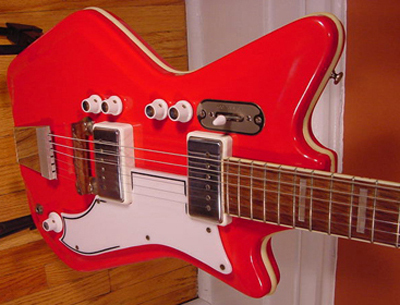 The Teisco Del Ray was perhaps the most popular student guitar from the 1960’s. No wonder guitars became so popular in the sixties, would you rather be playing a Teisco Del Ray or an accordion? 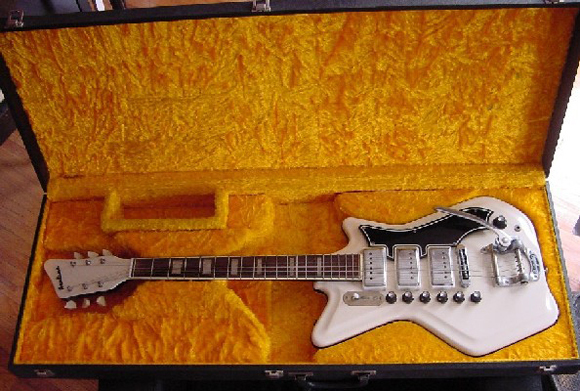 Below: One last Teisco, a Mosrite Joe Maphis copy, which was also the inspiration for the Eastwood Sidejack Series. Then, a couple of Italian masterpieces: The Cobra is one of a dozen or so NOS guitars that I picked up when the Milwaukee connection flushed their last holdings. The Galanti, on the other hand, is quite a rare bird. I’ve seen a few in Europe, but not over here. It is an extremely well made piece. The Victoria. I must say that this is perhaps one of the coolest guitars I have. This is truly a work of art. Art Deco. What a looker. It was recently re-issued through the Eastwood Custom Shop. The Regent is from Canada, the name Regent was a Canadian label for GUYATONE. Below: A few more Guyatones, the second one has a set neck, may be from the late fifties. Check out the pickguard on the middle one. Awesome! Next to it is an inexpensive Prestige Mosrite copy. Another 2015 Eastwood Custom Shop project was the Guyatone LG-50. Below: Far left is a guitar I lust after, but have never owned. I found it in a shop in San Diego but they were asking around $2000 for it. I found the one next to it on EBAY – in a severe state of dsrepair – for $100. I installed a tune-o-matic bridge and a Bigsby. Awesome player! Next to that are a couple of Norma’s and another attempt at copying the Burns pickguard. Below: Wickedly popular Univox Hi-Flyer. Eastwood makes an excellent Phase IV replica that is far better than the original. This photo is one of the earliest Hi-Flyer models. Next to that is a “Montclair” Burns copy, just like the Hi-Lo pictured earlier. A Welson Concord from Italy. Nice guitar and hard to find. Below: A Stafford semi-hollow body. A beautiful Hagstrom II and a Hagstrom Futurama. Hagstrom made some wonderful guitars with exceptionally fast necks. 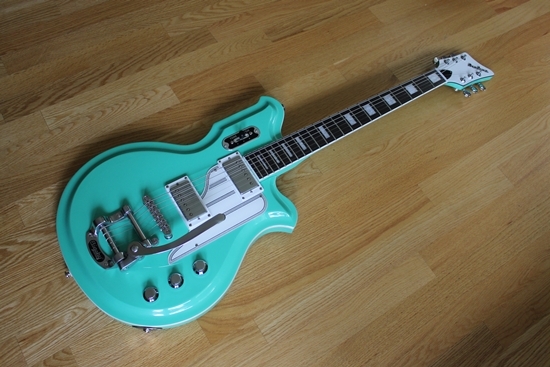 The greenburst is a Kawai and then a single pickup version of the Domino Baron. Below: Another of my favorite designs, the EKO 700, in two models, 4V and 3V. Equally nifty is the 500 3V. According to my neighbor, one of the best playing guitars in the entire collection, the single pickup 1967 Red Cobra. Next to that is it’s brother the Cobra Bass. Below: According to me, one of the best playing guitars in the collection, the Goya Rangemaster. Made in Italy. As is the beautiful Red Galanti and the Espana 335. The Espana is identical to the VOX Lynx. The GL Rangemaster is another outstanding Italian guitar. Lastly is a token Airline Bass with a white Gumby headstock. Below: More unusual suspects. Another Kawai 4 p/u Bison-like beast. Then, the ever-popular but VERY hard to find 1967 Teisco May Queen. (You can find a nice May Queen re-issue on the 1990+ page and another recent Eastwood Custom Shop model here). A very rare Norma split p/u Barney Kessel design. The timeless Teisco ET460 Del Ray and a simple Sekova Bison. Below: As you can see, we got our walls painted the other day, hope you like it! Anyway, on the left is an AWESOME Kawai Bass. This baby looks, feels, plays like no other Bass from its time. REALLY well made, big and heavy (the picture scale looks small but this is bigger than a Fender Precision). Next to that is a nice Silvertone Mosrite with slider controls. You can see the inspiration for the Sidejack Series in many of these guitars. Interesting because it as an indiviual slider volume for each pickup, so you can dial in an unlimited variety of tones. A 1965 Hofner Galaxie. An early 1960’s Vivona which was made by EKO, and a wee Hi-Tone. Wee guitar, HUGE head. Great canoe paddle. Below: Here is a nice ’62 Fender Musicmaster. Then two sweet GOYA Rangemasters and a wacky Galanti. Cool, Rare, but wacky! Next is one of my current favorites, a 6-string Espana Viola shaped guitar. Extremely well made guitar. This guitar was also made at the VOX factory, and shares all the same parts and finish ast the 335 style Espana pictured way up above. Below: A beautiful Ampeg AMUB-1 Fretless Bass. Nice piece. Eastwood has been making some excellent re-issue versions of this in fretless EUB-1 and fretted EEB-1 versions. Next, a MINT 60’s Airline Barney Kessel featuring the very cool “Kleenex Box” pickups, another current Custom Shop Reissue. Next is NOT a Univox Hi-Flyer, but a RAVEN. This is exactly the same as the Univox, but was imported to Canada under the brand Raven. Then, a 9.5 Silvertone Mosrite and a VERY odd and curious guitar labeled CONTESSA. It is from Italy, and looks, feels, smells, just like the JG Italians. Unbelievealby good player. Below: On the left is a RARE Wandre Doris from the mid 1960’s. A true work of art. Next is a nice ’67 Fender Jaguar and the ’67 Domino Spartan, costing about 7000% less. Lastly, an EKO Florentine Bass with it’s partner 6-string. I was really blown away by your website! I Originally came trying to find information about 3 pieces I own. One is what appears to be a Blues Master copy manufactured in Japan by Antoria. Second is a viola shaped Bass guitar, brand Cameo. And lastly is a sunburst finish, Cobra electric guitar. But it’s not EKO like the Cobras I saw here. Think I may have some fun finds in these guitars, have you heard of any of these types I mentioned? sorry, not familiar with those. Hi I also have the vintage 1960’s Norma and I was wanting to know how much it is worth? Back in the early 70s I had a Pan copy of a Ventures Mosrite ,I traded it in on a ’65 Hagstrom II when in retrospect I should have held on to it and paid cash for the Hagstrom.It was an amazingly well made and excellent playing and sounding guitar but I haven’t seen either one like it since and have even placed ads in various publications to try and find one but haven’t had a reply yet.I certainly would jump at an opportunity to buy one if it were to come up for sale now.Is anyone else familiar with this brand and model or even just the Pan name? Hello, I have a Vintage 1960’s Norma Barney Kessel Electric Guitar and was wondering what was the value of this guitar? Thanks! Hi – great collection pictured here! I have a guitar that I am unable to identify and value. It belonged to my grandfather. He had it as long as I can remember and I was born in 1964. The only identification on it is a small metal plate on the front face of the head that reads “MELODY” (in all caps). Starburst body with a black pick guard and some mother of pearl looking inlays on the fretboard – does that sound like anything you’ve seen before? Great page! I came looking for info on Domino Californian basses. Mine is cream colored, with a few little dings and a bit of rust but overall not bad. It has neck/body joint problems, but it’s playable. My web search suggests it was made by Teisco in the 60s when the Vox Phantom IV was popular, and perhaps sold through Sears. I was debating whether to throw it away or fix the neck. Your page convinced me not to throw it away. Can you tell me more about it? I have a 1963 Futurama Coronado Sunburst In Very Good condition. It was my cousins that passed away in 1967. Been wrapped in a closet for 50 years. I’m trying to figure out what its worth. I’d like to find a 60s era Fender Palomino. I live in Brazil and have been unable to find one here. WOuld you happen to know of one? Hi recently been going through some of my partners dad’s things after he unfortunately passed away and we found his old guitar that he used to play gigs with in the early 70’s. It looks to me like a Domino Dawson after some research, the bridge and tremelo arm set up are identical as are the scratchplate both the removable one and the fixed one at the point of the lower cutaway. The thing is the headstock which is more Gibson-esque wheras all the pics i’ve seen of the dawson dominos have more fender type stocks. Everything else looks identical, does anyone have any ideas for confirming identity? I have amazing, brand new with case Valco Brilhart s/acoustic electric, made in Chicago approx.60-63, can’t get any info about it, can you help? I own a vintage Norma Ukulele CU500 still in original box with the original warranty tag and pick. it has never been used and still has the original plastic bag inclosing the instrument within the box. it was a gift to me in the late 1960’s and I never played it. What is the current value of this ukulele? is it worth anything or should I just let my 2 year old grandson play with it? Just wanted you to know how elated my boyfriend was when he saw the Mosrite – It was in wonderful shape and you did a good job on making it look like it was not a guitar – – suprise for Christmas. He is really excited to have that one back in the house. Thanks again! Great job! Hope you have a great New Year. I inherited on of these “Vintage 1960’s Kawai Monster Electric Bass Guitar” yours is the closest I could find to what I have, mine has a sunburst finish. Do you know much about these? age, value….. Thanks for a wonderful gallery, I love this time period and styling and have myself fallen in love with many of these. Phantom guitars (www.phantomguitars.com) in Oregon makes modern repros of the old Vox / Domino styles, have you had experience playing any of these? Any comments on their sound or playability? Teisco EP-8T, a deep blood-red color, and my favorite player, just perfect in my hands in every way. Teisco EP-8T, another one but in yellow/brown sunburst, more condition issues but also quite a good player. My first electric guitar was a Montgomery Wards violin shape 6 string.I wish I could find one now ,but I haven”t been able to find even a picture of one. Any hints on where I might find a photo of one? Great website with useful informations on these gorgeous guitars. I own a guitar shop in Montpellier, France, have a look ! Found you site after being away for a while, your guitar photos are amazing. I have been looking for the first electric I ever owned. It was a 1960s SAVOY, single pick up, not to be confused with the Savoy guitar line. It was probably a Telsco made in Japan, and I don’t think they every made but the one style. I have found two on the internet, but neither one are up for sale. Have you ever heard or seen this guitar. Hello, I have a Vintage 1960’s Domino Dawson Sunburst Electric Guitar. I saw the exact one I have in an old 1967 Domino ad, but I am not sure which year or the value of it. It is in rather excellent vintage condition, minus the missing tremolo arm (bar) and is missing not all but 1/4 of a knob, but knob still works. This one has a distinct wavy triangle shaped pick guard on just the one side kinda a marble brown color. If you could at least let me know the exact year, or where to find out, I would appreciate it. Thank you. Valuing it would be hard without seeing it, but if you could range it. Thank you. Loved your pictures and in-site above. I do believe it is a 1966, my best guess. I have (and cherish) a1957 Fender Duo-Sonic, that was “willed” to me by a very dear friend who passed on a few years ago. I’ve been aquainted with this guitat since 1965. The 3/4 scale fits me to a “T”. I’m a short fella, as are my extremities. I refinished the guitar by veneering the top in oak and a sunburst finish was added. I replicated the pickguard in carbon fiber. This guitar had been re-painted five times previously. Never stripped! Just sanded and a new color applied. I had started the refinish project before Charles. passed and he did get to see the oak veneer and he really liked it. I just wish he could have seen the finished guitar. I had it refretted by Tom Dodson. An outstanding job! Shoot, ol Wilson Picket hisself played this guitar back in 66 or67. Now before someone has a hissyfit that i’ve ruined a “vintage” guitar, and diminished it’s value, remember it had already been painted five times before. Even in its original state its value is only about 1,500 at best. Besides l will NEVER sell ol”Snuffy”. I have an Excetro ES 335 copy. It’s a really nice guitar, I had a setup done on it last year and the guys at the guitar shop loved it. I cannot find any good info on Excetro guitars or any photos of other 335 copies by Excetro… Any suggestions on where I can get some info on this guitar? Thanks! So it is extremely rare!! Yes!!!! I have a 1967 domino fireball Great condition, need the OEM Bridge to make it mint. Hi, I’ve come across a Hagstrom Galaxy II guitar. I can’t find any info on it. Do you know anything about this model and what it may be worth? Hi there. Fantastic collection. I was wondering if you knew anything about Hagstrom II’s, relative to their serial numbers? I recently acquired one from my dad that I have been coveting since I can remember (actally looks identical to the one you have pictured)… I haven’t been able to find out much about dating them, so far. I do know that it’s from the early 60s. And, from what I’ve been able to find about the serial number, I think its rather old. Is that in your wheelhouse? Hi. Your Welson guitar is actually a WILSON. Made by Watkins Electric Music sometimes known as WEM in London, England. Wilson was the maiden name of the Watkins brother’s mother. Have a look on the ‘net for a Wilson Sapphire. Lovely instrument. What a beautiful collection! Thanks for posting the pics…I NEVER get tired of looking at these vintage guitars! I loved your collection. I thought I was weird for my love of the strange and wonderful 60’s guitars. Currently, I have a 1966 Tokai Hummingbird in Navy Blue, a 1967 Tokai Hummingbird in Cream, a 1968 Yamaha SG V with the Samurai Headstock in…let’s call it Lake Placid Blue for lack of an accurate name, a 1966 Teisco Spectrum V in blue, and one bizzaro from the 80’s, a 1985 Fender Performer in Pearl White. All have been professionally set up, and play as well as any Fender or Gibson (except for me 1965 Firebird). Thanks for sharing. I have a Domino Baron in the single pick up version exactly like the one you have pictured here. Any idea where I can find more info on them like what they’re worth? It needs a setup but overall a nice sounding playing guitar. The guitar and a ’66 Fender Blackface Champ were purchased for my brother in 1974 for $200. My brother never played so I “inherited” them. Still have the Champ too and doubt I’ll ever part with either for sentimental reasons. I am quite curious about the guitar though. I’ve never seen another like it. Would you please let me know how much the Domino Californian is valued at? I have one exactly like the white one, but the plate that goes over the strings at the bottom of the neck has come off and gotten lost through the years. Also that bar thing at the bottom has come off and not sure where it is. (I believe it’s used to make vibrations etc.). What’s the value with those two pieces missing, and the value if I find the missing bar. (sorry I sound like an idiot but I don’t know names for things like this). I’ve had the guitar over 20 years and it’s always sitting in a spare room being ignored. I also have a real pretty Sekova electric guitar and know nothing about it. I would text or email you pictures I took of it if your interested in corresponding with me regarding both. Is anyone interested in a 1967 JG on the pick guard ?? GOYA? CONTESSA JG BASS GUITAR ? MADE IN ITALY SERIAL NUMBER ON BACK > BOUGHT BRAND NEW IN BELLEVUE, WA IN 1967. I got it from my grandma who pasted ..please help what is this bass and how much is it worth does anyone want to buy it ?? HORNER GUITAR? Can you explain me this? Nice collection! I just purchased a stafford guitar, identical to the one you have on your site. Do you have any info on that model? I can’t find anything out about it. Do you know it’s value?? Could anyone give me an idea of the value. Very cool collection! I just required a vintage 60’s Japanese guitar. It looks very much like your teisco ep-7 hollow body except it has a Gibson open book headstock, whammy bar, and regular switches instead of rocker switches. Any idea what it may be? There is no branding or identification marks of any kind. I’m looking for a replacement 4 push button control panel, trem arm and trem cover for my early 60s Eko Ekomaster. Any clues on where I should look? i have a white airline guitar identical to the white one you have pictured. orange lined case also. the only thing missing is the nametag…am looking to sell it any idea what its worth? Researching one of my guitars and stumbled on to your very comprehensive site. I have Guyatone that you do not have pictured. It’s a sea foam green Beatles Bass style 6 string! Branded Ideal. Not looking for worth or anything, just wanting to know if you would like a picture of it. I just acquired a guitar that would fit nicely in this collection. Of course I am hungry for information on it. Would anyone be able to tell me more on this one? I love this article . I have a ep-8t myself. I HAD A 1967 GALANTI GRAND PRIX (IN GREEN) – BEAUTIFUL PLAYING & GREAT SOUNDING – WISH I STILL HAD IT ! ALSO -A 1966 RED HARMONY ROCKET – NOT THE BEST ACTION , BUT LOOKED LIKE A GRETSCH . WISH I STILL HAD IT , AS WELL ! I understand completely the attraction of these guitars and the thrill of getting something really iconic. I bought my first electric guitar at the age of 70 (having played-not very well- classical for years) and always get a rush when I plug in and twang it! Hi, I have a Guyatone LG 130T, it is my first electric guitar, my father bought it from a pawnshop in TX. What is its approximate value?….Thank you! I have a Hofner guitar with 2 pick ups that has a leather base solid, i am looking to sell it and i have no idea where to start. I do know that it is at least late 60’s early 70’s I Can Not find another one like it anywhere and I have looked any help would be appreciated. That white Teisco that was unnamed is a Teisco Et 210, it’s still disputed if its a 210 or 200 but I have one and I believe it’s a 210. Mines a cherry burst. I would like to know the a proximate value of this guitar. There is no manufacturer’s mark. It only says “Made in Japan”. It is very good condition. Read your blog with great interest. My parents in Northeast Alabama have a Montclair acoustic guitar, a blonde wood with double white line trim and the white cutaway playguard. It was my grandfather’s, as some young man coming through Ft. Payne, AL traded it to him for gas at my Grandpa Bell’s gas station around 1964-66. Haven’t determined make year, but around then. Do you have advice on how/where we should sell? I’ve been looking at vintage guitar shops and eBay. Thanks. Sad to say i,m looking for a good home for it, as i,m now 72 and it’s time to part, it’s still in great condition with it’s original case, the case has a little corner damage. I have searched the net to see what it would be worth but can’t find anything as a guide. What would a guitar like this be worth in todays market. PS : I do have photos. I have a Tiesco Del Ray Vibratwin 12 string guitar. Was seeing if you knew anything about it. It was my dad’s. Hey.. can you help me find a whammy bar for my Tesico Del Rey ET-200? I just.. can’t. I’ve spent hours looking. I’ve ordered parts. I’ve used a digital caliper. I’m dumb, I guess. Help. I have a Vintage Bass Guitar that my late Father had in his band in the 60’s but have no idea exactly what it’s worth or anything else about the make of it. Could you please help me with that. It looks very similar to the Vintage 1967 Domino Spartan Electric Guitar, with the exception of it being a BASS GUITAR. are Sunburst. Both have e-tuner, distortion and treble/bass boost. All electronics work. I believe they were built around 1967-68. I do not see these guitars very often. Do not know if this is because they are rare or because they were not popular. Could you help me with any information and posable value. Thanks. Was looking for information about my 1960 Harmony Alden Strat. I have a Harmony Mars Tuxedo with dual Hershey bar pickups, and two sets of control knobs…The jack is on the bottom end. i can only locate two maybe three others online. I was trying to find out how rare the guitar is, and how would that reflect the value. p.s. I saw a picture in your beautiful collection of my very first guitar. (or very-very similar) And for the life of me, I cannot remember what ever happened to it (45 yrs ago). I may need to investigate that. lol Pictures are amazing to the memory. Thank you for sharing! Great sight. I have a 60’s vintage Danelectro Silvertone. It has 2 De Armond lipstick pickups and the amp built in the case. The amp has the built in trem system and the foot pedal to go along with it. It was bought in about 1984 for $75.00 after spending most of it’s life in the case under the bed. it still plays great and the neck is arrow straight. HI, I OWN A EKO 700-4V GUITAR. AND IM LOOKING FOR SOMEONE TO HELP ME GETTING IT SOUND AGAIN. BRIDGE IS MISIING. SOMEONE HAVE ANY CLUE HOW WOULD ME INTERESTED? I tried searching it online and so far it looks like Martinez only makes acoustic-electrics. That being said, did they ever make straight up electrics??? Hi there !!! Love the website !!! I’m trying to identify this guitar , single cut semi-hollow, bound top and bottom , F hole with two dot holes , triple dog ear P90s with individual V/T knobs and the pointer pickup selector switch, headstock is 6 on the left and has what almost looks like the Ferrarri emblem … Is there an email address I can forward you the pictures ??? Thanks !!! Would like to purchase one (1) neck pickup (vintage) that has the black top plate and white shoulders (cream looking because of age) like the pickups on that Domino Dawson you have posted on this great site of yours which serves as an appreciated resource of info. Do you know anyone selling? These pickups were supplied on many gits back in the day such as Aria, Greco, Lyle, Conrad, Domino and others. Sure would appreciate a lead. Nothing that matches correctly on eBay lately (Jan. 2017). I stumbled across your blog trying to find some info on a guitar I aquired in the mid 90’s. It is VERY similar to the pic of your tradition xenon. Its the same body and pick guard shape and has the same finish. It has a “lafayette” badge on the headstock and has 3 chrome/gold foil pickups, 3 toggle switches, 3 knobs(2 volume, 1 tone) and no tremolo. I can not seem to find and info or photos of this identical guitar anywhere on the web. Im hoping you may be able to share some info on it. Thanks! My husband passed and he has a Eko electric bass guitar. It says made in Italy 995. It would have to be restored as there are a couple of cracks. He also has a large Fender amplifier. Can you give me an idea of what I should sell them for? had one back in the 60’s; had grey cabinet, also made a bass amp. I have an old school guitar i believe was made in 3-1969, as there is red ink written under the volume and tone box, where the electronics sit. It might be a Sears or Monty Wards, or a Japanese model. It ha 4 pickups and the volume and tone are adjusted with plastic dials that roll in the guitar. They dont rotate like tge newer knobs. Im trying to find out what jnid of guitar it is. I’m in process of rebuilding it. There are also 3 plastic switches for each of the two dials, mic. 1 & 2 up top 3 & 4 beliw and a rhythm & solo switch for both. These switches are block style and they toggle in and out of the guitar like the dials. Is there a way to attach a pic or vid. to see if someone there can tell me what kind if guitar it is? Does anyone ever reply to the posts? I had one of those Eko 700 v4s. Apart from the bizarre shape, it played very well and had a good range of tones. It cost £45 in 1963, which was a lot in those days. I have a Silvertone electric guitar U.S.A. model 319.14798. Cannot find this model anywhere online. Can someone give me as much information as possible? ANY INTEREST IN SELLING THE AMPEG AMUB-1? I’d be very interested in making a deal for it if available ! This is a great page! Thanks for helping me find the EKO Florentine. I’d seen this guitar very briefly in a Hives video and fell in love with it. If I can ever afford it, I want to get an EKO Florentine and have it refinished in the same style of a gold-top Les Paul. I have a 1960s EKO Florentine but in sunburst rather than the red. It’ s had a rough life and was in two parts when I got it. Is missing the scratchplate and trem arm (made a substitute ) and did not have the original bridge – I have used a roller bridge from a scrap guitar. Plays beautifully after refretting and setup. Blondie). Is there any value to it? Anybody know any good sources for information and/or parts for 60s Japanese guitars? A friend gave me a 61 Univox Supreme to restore and I’m floundering. I have one of the few Danelectro Coral teardrop electric guitars that was assembled before MCA closed their factory and sold the parts. Have you seen others and is there any interest out there? In great condition and beautiful. Does anyone know what kid of guitar is this? Absolutely amazing information. Thank you so much for investing your time in this. It is appreciated. Hi, I am selling an “Eko explorer” from 1967, archtop hollowbody, totally acoustic, color “See trough red”, year 1967. Could you be interested in the vodtra splendid collection? Early 1960’s Welson Vibrato, push button, 3 pickups, excellent condition. Does anyone know the approximate value? Greetings. I have a bass viola by Lion Foreign but I do not have any information about her. Is someone interested in buying it for an economical price? That white 60’s Teisco ET-??? with the striped pickguard and sharkfin headstock is in fact a model ET-210. I also have a few Stratocasters, but the Teisco remains my favorite guitar. The action is unbelievably low, the pickups are hot, and the intonation is great for such a lightweight instrument. 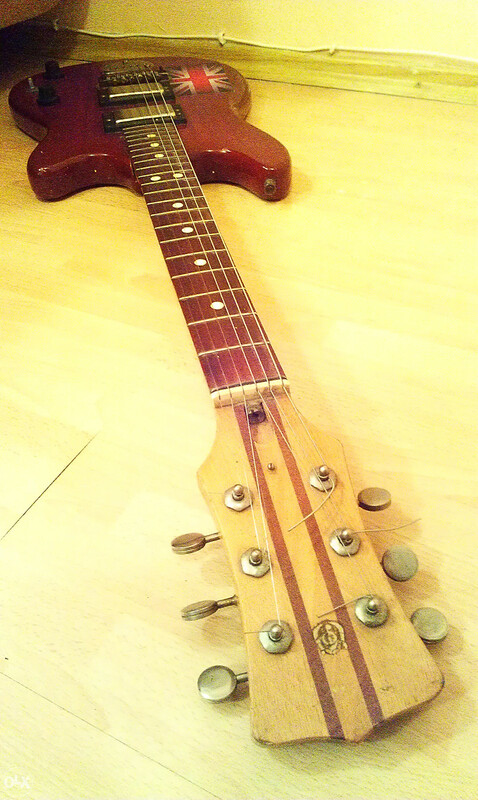 The Mosrite whammy and roller bridge is simple but it works well. Since I don’t really do many spectacular dives I removed the bar, but I can still deflect the vibrato assembly just enough with my pick hand to get some cool sweep effects going when combined with a phaser. Great collection ! Many many thanks for sharing. Just started mine too : Silvertone 1478, a couple of Kent (Copa & Videocaster),etc. but really far from yours. Good to see I’m not the only one obsessed by “subclassed”/underated guitars. On my opinion, they are the true Rock’n Roll instruments for people who are not “well educated” musicians &/or wealthy but who loves the energy of the music given by these raw instruments. Not everybody is Eric Clapton ; not everybody wants to be Clapton. One last question : do you collect vintage amps as well ? I am restoring a Domino Hollow body for a customer. Unfornunately the pickups and mounting rings are long gone. Any information on the this would be much appreciated. Help, i have this old guitar my dad bought in the 1960’s it ia a Barclay S69 hollow body electric guitar model 2796H54-1. Do you know anything about these guitars ? Hello. I have had many guitars over the last 47 years. Only six at the moment. I am trying to identify a Guyatone that I got at a swap meet in the S.F. bay area back in the 80’s. I have been searching the web for a couple weeks, and can’t find a single photo, drawing or ad for this one. The guy said it was from Japan. I am wondering if I have one that was not mafe for export. It is similar in shape to an lg 170t. It has 2 single coil pickups with massive slugs, trem arm, 1 vol and 1 tone knob in the usual spot. Where it is different from all the others I have seen is the two 3 position rocker switches on the upper horn. It has the Guyatone G logo on the headstock and the truss rod cover says Tokoyo Sound Co. Ltd. The back of the headstock had a small metal Made in Japan tag held on with tiny nails. It is in great condition except for dirty rocker switches. It has a very unique fat warm sound. I can send you photos and even a video I recorded using it 17 years ago. Any ideas on what I have? Hello, I have a Peachy Keen (Vintage 1967 EKO Condor Electric Guitar)and was wondering what was the value of this guitar? May anyone guide me please ? I have a Delray classical guitar, Model G465 that was in process of being refinished in late 60s by a lutenist when he became ill and just put it back in its case. It’s still got dried-on paint remover. It’s been a part of my personal baggage for 55 years. Does it have any value to someone to complete the refinish? Not sure how this works but I have a Delray classic guitar Model G465 from the late 60s that was being refinished by a lutenist who became ill and just put it back in its case with dried-on paint remover. Does it have any value to someone to refinish. I have carried it around for 55 yrs.